Shoji Tabuchi Show is one of the most popular shows in Branson that never fails to amuse the audience as it is combined with the amazing performances of Shoji’s wife, Dorothy and daughter Christina. This Tabuchi family show in Branson lets you enjoy spectacular performances showcasing blazing violins, stunning harmonies, and world-class choreography. This brilliant violinist in Branson has hand-picked the members of his band from regions around the world to come join him, and most of them have at least one degree in music study. This family variety show features a wide range of music genres from classical to contemporary. In this popular show at Shoji Tabuchi Theater, Dorothy is responsible for the choreography, and she has successfully produced an elite group of dancers that help create a visual for the musical tracks. The Shoji Tabuchi Theater is the other star of the show where even the restrooms are works of art. At the men’s room, you’ll find a fireplace, leather seats, and billiard table. The ladies’ room boasts fresh orchids at each onyx and granite sinks with faucets made of gold, and a ceiling where its design come from the 1890s Empire Period with chandelier. As the show starts, you’ll see cowboy ropes twirling, Taiko drums beating, and Christina singing vocals that will seem to invite everyone to hear her sing great music for a split moment. So, don’t miss out this Shoji Tabuchi Show in Branson, a one-of-a-kind production that brings some of the best entertainers to ever perform in Branson entertainment circuit. Aside from the extraordinary talent of Shoji on the violin, the show features exquisite sets, singers that are worthy of headlining a show, dancers with sensational flair and impeccable timing, an unrivaled band, and skilled performers honed by generations of Japanese entertainers. The variety of music that you enjoy in this show is impressive, you’ll hear pop, country, and the extraordinary performance of Shoji as a classical violinist. On select dates, you can also enjoy the beauty and talent of Christina, Shoji’s daughter, who’ll sing and dance her way into your hearts, and his wife, Dorothy, another talented performer. As the director, creator, and producer of the show, Dorothy also supervises the intricate choreography of the many show numbers and makes sure the show runs smoothly. 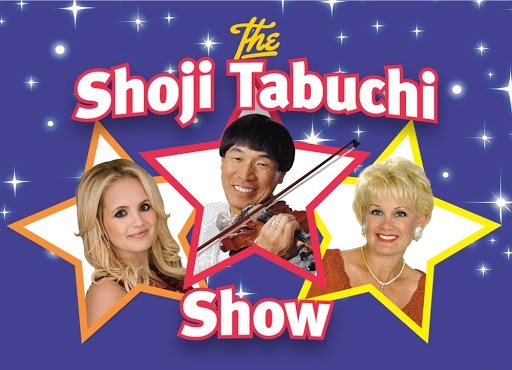 Shoji Tabuchi Show is such a great family show in Branson that comes with extraordinary musical entertainment that every music lover raves about. The show features an astounding variety of dancing and singing productions that rival the pure entertainment show of Las Vegas and New York. This spectacular family production show consists of an excellent sampling of Shoji’s world-renowned showmanship as an entertainer and his mastery in violin playing. Plus the extraordinary vocalists uplift the musical excitement with lovely ballads, classical songs, and gospel music that give delight to the toe-tapping audiences. So, if you want to watch one of the most spectacular shows in Branson, don’t miss to visit Shoji Tabuchi Show where you will see Shoji’s amazing performance of blazing violins.